Welp guys, sorry I haven’t been posting Christmas cookies and treats like I’m supposed to be doing. I wish I could be one of those bloggers who had hundreds of posts lined up and ready to be published. Nope, I have exactly none. I pretend it’s because I like to live in the moment and blog about what my heart wants me to. But let’s be real, I’m just a horrible procrastinator. Like I said, I am the worst. So yeah, my husband came home a couple weeks ago. On Thanksgiving, actually. It’s quite a different experience this time around. Last time he returned from Afghanistan – because of how the war was going and probably because it was his first deployment – things were just bad. Just really, really bad. This time, it’s been really easy. It kind of just seems like he’s been gone for a week instead of 9 months. Whereas last time, it took us about 7 months to get to a good place. It’s crazy different and I’m very grateful for it. But I’m finally here with a Christmas treat! 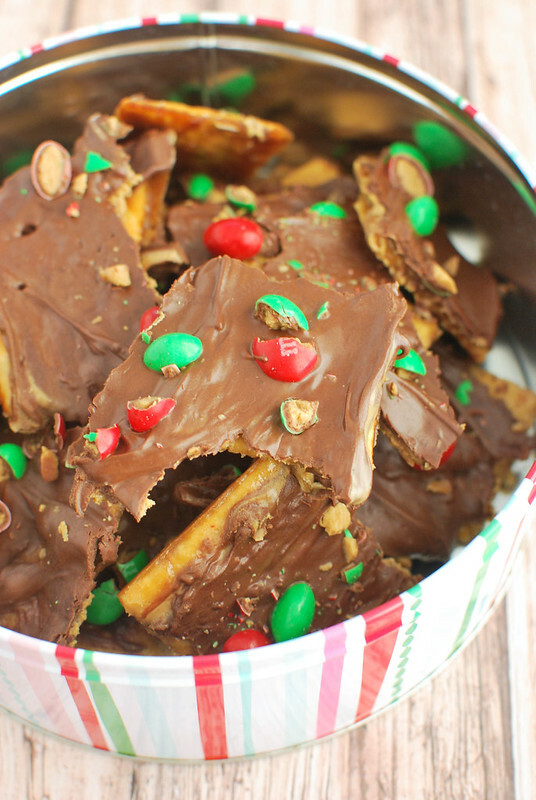 I’ve been meaning to make Saltine Toffee for years and years but I always run out of time and energy – finally managed to get it done this year! And I added peanut butter because why not? 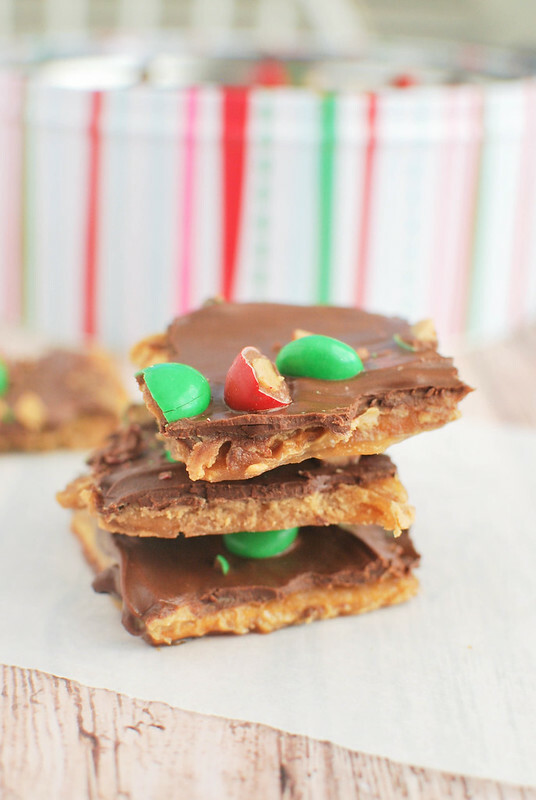 And peanut butter M&Ms because… duh. It’s delicious. And I hate Saltines with a fiery passion. But the sugar mixture and then the peanut butter and then the chocolate… it’s just sweet and salty and I love it. I do have more Christmas-y recipes coming. Hopefully.I’ve had several cookie fails lately so we’ll see. I’ve got a drink coming for sure. Don’t even worry about that. Preheat oven to 400F. Line a large, rimmed cookie sheet with parchment. Lay the Saltine crackers down in a single layer on the parchment paper. Put the brown sugar and the butter in a small saucepan. Melt the butter and bring to a good boil. Boil for 3 minutes without stirring. Pour the mixture over the crackers. Put in oven for 5 minutes. Remove from oven and dollop spoonfuls of peanut butter over the crackers. Return to oven for 1 minute. Remove and spread the peanut butter all over the crackers. Top with the semisweet chocolate chips and return to oven for 1 minute. Remove and use a spatula to spread the chocolate all over the top. Top with the chopped M&Ms. Let set completely (I let mine sit overnight) before breaking apart. 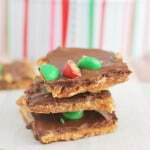 8 Responses to "Peanut Butter Saltine Toffee"
Love this! Seriously taking it to a whole new level. And I am so very glad to hear things are better this time when your husband came home. I can only imagine how much the war affected him last time and in turn affected you and your relationship. Take your time and enjoy being together. 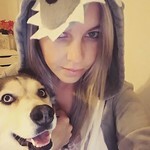 The blog will always be there! So glad everything is good and hopefully you can enjoy Christmas. This toffee sounds fantastic! LOVE that you added peanut butter! I’m such a bad procrastinator too, so don’t feel bad! And that’s some good looking toffee!! Pinned! I’m not a big fan of eating Saltine crackers as is either, but I bet the saltiness goes really great with the sweetness! These are on my list to try!!! I actually love saltine crackers SO much! 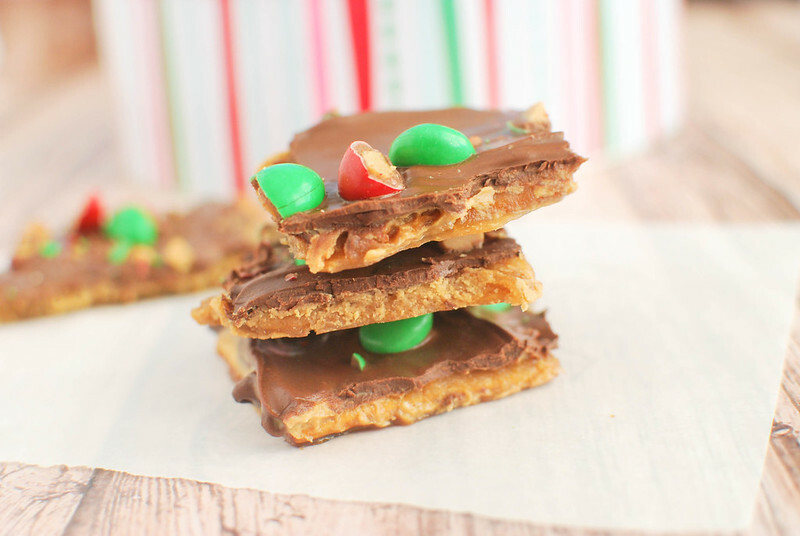 So toffee with em and lots of peanut butter sounds absolutely perfect. And I love how easy and quick that ingredient list is! Also I love that cute container you have holding them all!